These companies are generously supporting IxDA Oslo and our efforts to foster collaboration and sharing throughout the UX community in Norway. They form our advisory board, and through their professionalism and experience, help IxDA Oslo on its path to becoming a leading resource and focal point of our professional community. Bekk is a Norwegian consulting company. We carry out projects for large private and public companies in strategic consulting, development of IT systems and design of digital services. We are currently around 400 employees, with offices in Oslo and Trondheim. Blank er et teknologi- og designmiljø med en alternativ filosofi og tilnærming til konsulent- og arbeidslivet. Vi utvikler også egne produkter, har høye ambisjoner og må bli flere for å kunne levere på målene våre. Bouvet provides services in the fields of information technology, digital communication and enterprise management. Bouvet more than 1000 employees divided between 14 offices in Norway and Sweden. The company is a strategic partner for a number of enterprises, helping them to shape digital solutions which create new business opportunities. Clients appreciate Bouvet’s good grasp of their operations, and a broad range of services allows it to act as a turnkey supplier. Bredvid er et norsk konsulentselskap som leverer tjenester innenfor områdene rådgivning, utvikling, UX og skytjenester. Vi utvikler digitale løsninger i både privat og offentlig sektor, og skaper forretningsverdi ved å sette kunden og kundens suksess først. I tillegg har vi et nettverk av kompletterende samarbeidspartnere i både inn- og utland. Vi er ærlige, engasjerte, åpne, nysgjerrige, inkluderende, og dette ligger til grunn for alt vi gjør. Ciber leverer morgendagens brukeropplevelser for noen av Norges fremste digitale aktører. Vi er 150 engasjerte medarbeidere med spisskompetanse innen design, forretning og teknologi. Ciber Design Lab har fageksperter innen tjenestedesign, interaksjonsdesign, grafisk design, brukeropplevelse og designledelse. Computas er en norsk leverandør av IT-løsninger og rådgivningstjenester innen teknologisk innovasjon. Vi jobber med alt fra apper som redder liv og prisvinnende saksbehandlingsløsninger, til dataanalyse, kunstig intelligens og omfattende, skybaserte innovasjonsprosjekter. Vi er en annerledes arbeidsplass med nesten 300 ansatte. Vi er 100 prosent eid av våre ansatte, så her blir du både kollega og medeier. Skaperglede og samarbeid er kjerneverdier i vår måte å jobbe på. Fra august 2018 har vi hovedkontor på Akersgata i sentrum av Oslo. Vi har også en regionskontor i Stavanger og et datterselskap, Computas IT Romania, i Bucuresti, Romania. Designit is a global strategic design firm hell-bent on solving the world’s most intriguing problems. With 290+ professionals working out of 13 offices in 10 countries, we help ambitious companies make innovation happen. Our aim is to create strong and sustainable business value through strategy and design. EGGS Design is a multidisciplinary design consultancy housing Scandinavia’s widest design competence, with expertise in technology and in designing digital and physical products and services. Our approach is people and business centric. Together with our clients, we innovate and create the magic between hardware, software and services to create attractive and intuitive solutions. Forte_ is an international consultancy that builds digital products and services through cross-functional teams and digital platforms. We focus on relevance to make sure the solutions are on target both for businesses and users. We find elegant solutions for complex problems through innovative concepts, early and continuous user involvement, iterative development and flexible technology. Halogen is one of the leading digital design consultancy companies in the Nordic region, with expertise in design of critical systems and applications, websites, Intranets, products and processes. One common denominator in all our services is a human-centred design approach aiming for holistic user experiences. We design both with and for end users, and facilitate innovation and change processes for our clients. Halogen has been in business since 2001. Our operation is primarily located in Oslo city centre, but we also have satellite offices in Stavanger and Berlin. Itera is more than 460 dedicated specialists in communication and technology . We operate in flexible teams across disciplines, geographical borders and customer industries. Itera believes in values as the basis for building a strong company culture. Our values are innovative, passionate and skilled. They tell our customers what they can expect from us. We have offices in Oslo, Bryne, Stockholm and Copenhagen in addition to Bratislava in Slovakia and Kiev and Lviv in Ukraine. Itera is listed on the Oslo Stock Exchange under the ticker ITE. Kantega er et IT-selskap med rundt 150 stolte medarbeidere. Vi eier vårt eget selskap. Det gjør noe med oss og forholdet til kundene våre og løsningene vi lager: Fantastiske IT-løsninger, som gir verdi og som brukerne ikke klarer seg uten. I Kantega brenner vi for godt design og elegant teknologi. 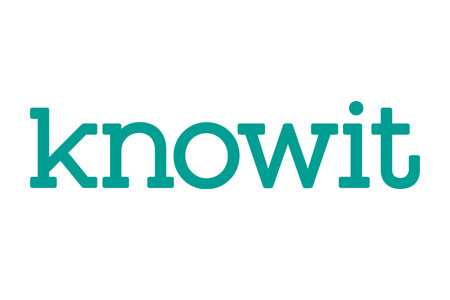 Knowit is a consultancy firm that creates unique customer value in a world of accelerating digitization, by offering international solutions in three divisions – Experience, Insight and Solutions. What sets us apart is our ability to combine expertise in design and communication, management consulting and IT. Knowit has around 1850 employees in 14 locations in Sweden, five in Norway and one each in Denmark, Estonia, Finland and Germany. Knowit AB is listed on the Nordic Exchange in Stockholm. Making Waves is a consultancy with 275 skilled and enthusiastic professionals in the fields of strategy, design, technology and communication. We create solutions based on a solid strategic foundation, service-design, user-centered development and holistic communication. Our goal is to design, develop and maintain digital services which engage people, strengthen brands and create value. NAV leverer løsninger til hele Norges befolkning. Vi skal være der når det er behov for oss, fra de gode periodene i livet, til de litt tyngre. Teknologiutviklingen skyter fart og NAV har store ambisjoner for fremtiden. Vi skal designe og utvikle verdens beste velferdsløsninger - for deg og dine, for NAV og for samfunnet. Derfor bygger vi opp et internt designmiljø som jobber bredt innen UX-design, tjenestedesign, grafisk design, brukskvalitet og universell utforming og vi ønsker å bidra med å forme framtidens UX-miljø i Norge. Netcompany er en betrodd digitaliseringspartner for kunder innen både offentlig sektor og større private virksomheter. Med omfattende teknologi- og designkompetanse skaper vi innovative løsninger der vi tar et helhetlig leveranseansvar for prosjektene vi gjennomfører. Vi har vind i seilene og opplever at vårt miljø innen design og brukeropplevelse er i kraftig vekst. Netlife is a user-experience consultancy based in Oslo, Norway. We are dedicated to creating user-friendly solutions that our clients and their customers love. Founded in 2000, we have more than 10 years of experience in the field of web usability, user experience, human-computer interaction and graphic design. Sopra Steria, European leader in digital transformation, provides one of the most comprehensive portfolios of end to end service offerings in the market: Consulting, Systems Integration, Software Development and Business Process Services. Combining high quality and performance services, added-value and innovation, Sopra Steria enables its clients to make the best use of information technology. Visma has one of the largest in-house UX teams in Scandinavia with approximately 90 UX professionals and we are continuously growing. We have existed since 2006 and have successfully brought UX and design processes to the heart of Visma, and most of our product development efforts entail UX-related work. Read more about how we work at our UX blog or take a look at our UX portal.